The 2,600-year-old Cyrus Cylinder, widely considered the world’s first human rights charter, is now on display in Washington, D.C. ― the first stop on its tour of five U.S. museums. The U.S. founding fathers were inspired by the Persian monarch Cyrus’ tolerant rule of the first multilingual empire, which spanned from Egypt to India. “The story of Persia — Iran — is part of the story of modern United States,” according to British Museum Director Neil MacGregor. The nine-inch long clay artifact was unearthed in 1879 by a British Museum team in modern Iraq. It features an account of Cyrus’ conquest of Babylon in 539 B.C. But the cylinder is better known for the king’s proclamation of linguistic, racial and religious equality – a revolutionary concept in the ancient world. Cyrus also allowed slaves and deported peoples to return home to rebuild their temples. Thomas Jefferson, the third president of the United States, valued Cyrus the Great’s legacy. Jefferson, Benjamin Franklin and other founding fathers read many ancient historical works in Greek and Latin. “In the 18th century, that model of religious tolerance based on a state with diverse cultures, but no single dominant religion, became a model for the founding fathers," said Julian Raby, the director of the Freer and Sackler galleries hosting the exhibition. The Cyrus model of governance may have influenced Jefferson’s writing of the U.S. Constitution. Jefferson owned two copies of the Cyropaedia, a partly fictional biography of Cyrus written by Xenophon, a student of Socrates in the fourth century B.C. Jefferson instructed his grandson to read the book after mastering Greek. Jefferson would have also been familiar with biblical references to Cyrus. Ezra and Chronicles both relate how Cyrus allowed the Jews in Babylon to return to Jerusalem and rebuild their temple. The cylinder’s text seems to validate the biblical account. President Harry Truman saw himself as a modern Cyrus when he directed the United States to recognize the State of Israel in 1948 ― against the preference of many policymakers in Washington. Part of Truman’s support for the Jewish state was based on his reading of the Bible. In October 1971, Shah Mohammad Reza Pahlavi celebrated the 2,500th anniversary of the founding of the Persian monarchy by Cyrus. For the occasion, Iran presented the United Nations with a replica of the Cyrus Cylinder. U.N. Secretary General U Thant called the proclamation one of man’s “early attempts to establish peace in the world.” The model remains on display at U.N. headquarters in New York, with translations of the text in Farsi, English and French. 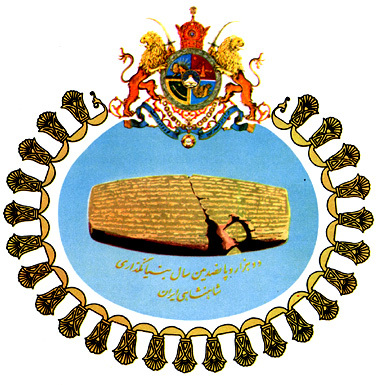 The Cyrus Cylinder was also used as the emblem of the shah’s opulent celebration at the ancient capital of Persepolis and the tomb of Cyrus in Pasargadae. About 600 guests, including dozens of heads of state and members of royal families, attended the event, which took years to plan. Cyrus the Great is widely seen as a national symbol of pride in Iran. Individuals ranging from Shirin Ebadi, a human rights activist and a former judge, to President Mahmoud Ahmadinejad admire Cyrus and value his legacy. The British Museum was due to loan the cylinder to Iran in fall 2009 at the request of Ahmadinejad’s government. But the museum hesitated given the tense political situation after the disputed June presidential election. The Iranian government reportedly threatened to cut ties with the British Museum if it did not lend the cylinder. Eventually the museum agreed to loan the object to Iran’s National Museum for four months. The opposition Jaras website criticized Ahmadinejad’s comments, according to Radio Free Europe/Radio Liberty. Jaras called the cylinder a “stranger in its own home,” given the government crackdown and accusations of electoral fraud in the 2009 presidential election. The Cyrus Cylinder exhibit was so popular with Iranians that it was extended for another three months. The following video by The Economist features an interview with Director of the British Museum Neil MacGregor on the Cyrus Cylinder.